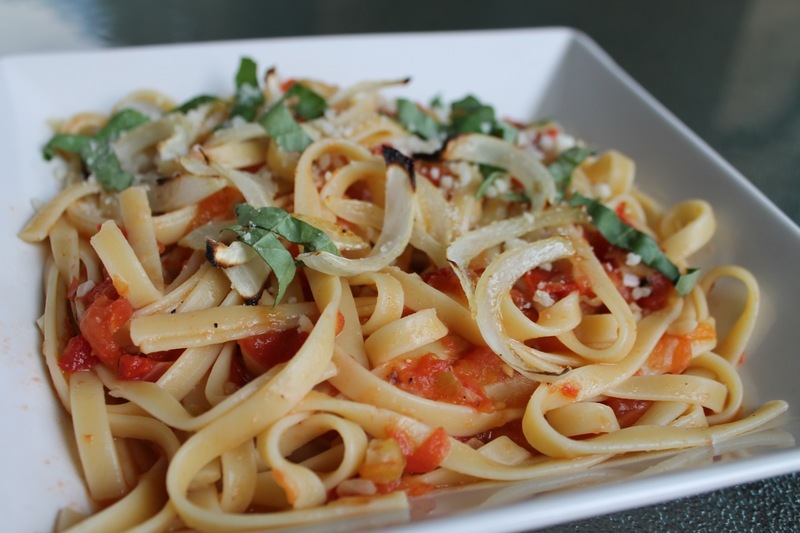 Roasted tomato sauce made with seasonal fresh tomatoes paired with pasta and basil is one of our favorite summer dishes (I made it several times last year, see here and here). 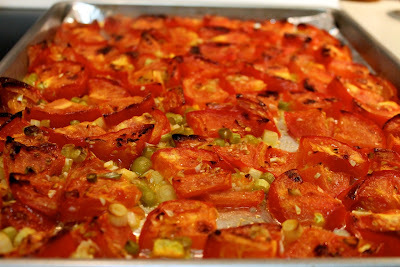 The kitchen always smells really great too after tomatoes have been roasting in it all afternoon. That, however, is the catch of roasted tomato sauce: it takes a long time, 2 hours minimum and really more like 3 for optimal flavor. It's great for a weekend meal with a free afternoon, not so much for a midweek dinner. So I decided to experiment with the broiler: using higher heat, could I achieve something almost as delicious as slow-roasted tomato sauce if I also added some additional flavor? Enter green garlic: the early summer farmers market staple that looks like a scallion but with mild garlicky flavor. Along with my tomatoes, I roasted several green garlic bulbs with their greens. The resulting pasta sauce was quite delicious, perhaps not with quite the depth of tomato flavor from slow-roasting, but the added green garlic gave it enough punch to be interesting. And, for a midweek meal, you can't argue with the significantly reduced cooking time. 1. Cook pasta according to package directions for al dente. Reserve 1/2 cup pasta cooking water, drain pasta, add half the water to the noodles and set aside until ready to use. 2. Preheat oven broiler with oven rack 8 inches from broiler. In a large bowl, combine tomatoes, green garlic, 2 tbsp. olive oil and kosher salt, stirring to evening coat ingredients. Spread tomato mixture on a baking sheet and broil for about 25-30 minutes until the tomatoes are shriveled looking and browned on the edges. Remove from oven and allow to cool slightly. 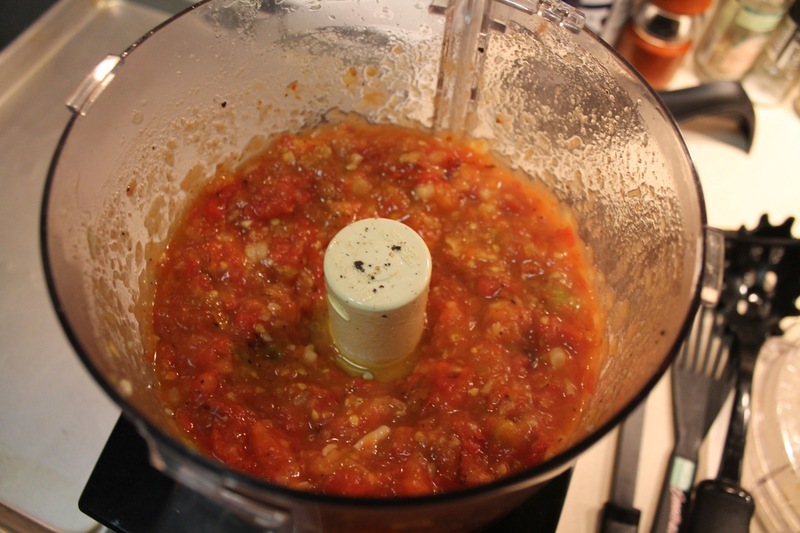 Transfer to a food processor, add nutmeg and honey and pulse 4 or 5 times (1 second pulses) to make a chunky sauce. 3. Raise oven rack to about 4 inches from broiler. Spread onion slivers on a baking sheet and toss with a little olive oil and seasoned salt. Broil until edges are browned, about 2-3 minutes (watch carefully to prevent burning). 4. Combine tomato sauce with cooked pasta, adding additional reserved pasta cooking water until saucy. Serve pasta in bowls topped with broiled onions, basil and grated parmigiano-reggiano. This is a perfect summer pasta. When are we having it again? !